Dubai, U.A.E., 8 January 2019- Between January and December 2018, Emirates SkyCargo, the freight division of Emirates, flew close to 2.6 million tonnes of cargo across six continents. From fruits and vegetables to space satellites, from pharmaceuticals to domestic pets, the air cargo carrier transported goods that have had a direct positive impact on the lives of millions. Here are some of the ways through which Emirates SkyCargo has touched the lives of people across the world. In 2018, Emirates SkyCargo carried over 73,000 tonnes of pharmaceutical cargo. With its fleet of over 270 modern aircraft and state of the art facilities including the world’s largest EU Good Distribution Practices (GDP) certified multi-airport hub at Dubai, Emirates SkyCargo is able to securely and rapidly transport vaccines and other critical medicines around the world to destinations where they are most needed. In August 2018, the air cargo carrier operated an exclusive freighter flight carrying the equivalent of 1.8 million doses of vaccine from Italy to Brazil. With 36 special purpose containers, this was one of the largest and most technically challenging pharmaceutical charter flights undertaken by Emirates SkyCargo. Addressing the importance of offering enhanced protection to pharmaceuticals on the move, Emirates SkyCargo introduced the pharma corridors initiative across select destinations on its network. Working with ground handling partners and other stakeholders, the initiative ensures uniform high standards for the handling of temperature-sensitive pharmaceuticals from origin to destination. 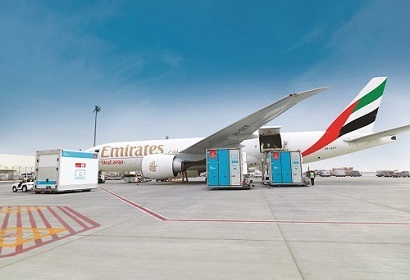 Emirates SkyCargo currently has 20 pharma stations across its network. Over 1,100 tonnes of food including fruits, vegetables, fish and meat, were transported every single day by Emirates SkyCargo in 2018. With increasing levels of interest globally in international cuisine and culinary flavours, more and more people are looking to source produce from around the world in their local supermarkets. Emirates SkyCargo plays an important role in satisfying this global demand by air freighting food items. Perishables as diverse as salmon from Norway, mangoes from South Asia, meat from Australia, fresh seafood from Sri Lanka, Scotland and South Africa, dairy and chocolate from Ireland, green beans from Kenya, lychees and rambutans from Vietnam, strawberries from California, wine and cheese from France make their way to consumers across the world on Emirates’ flights. Through Emirates Fresh, the air cargo carrier’s specialised portfolio of solutions for perishables transportation, Emirates SkyCargo ensure that food items retain their freshness and arrive at their destinations on time. From cherished pets to super cars and satellites, Emirates SkyCargo has developed vast expertise in transporting cargo that is extremely valuable to customers. In 2018, the carrier transported 7,900 domestic cats and dogs on its flights. The carrier also launched Emirates Pets, a product designed to offer convenient and comfortable air transportation experience for domestic pets with options for door to door pickup and delivery of the animal. Over 1,140 premium and luxury cars were transported by Emirates SkyCargo in 2018. The carrier transported two special Alfa Romeos for the Gumball 3000 motor rally. Other super cars transported over the year include a DeLorean from Los Angeles also for the Gumball 3000 motor rally; a Koenigsegg Agera RS1, one of the only 25 cars in existence in the world; and an Aston Martin One 77 which travelled from Auckland to London on Emirates SkyCargo. Emirates Wheels continues to be popular with customers looking to transport their cars by air for their holidays and for events. In February 2018, Emirates SkyCargo transported Khalifasat - the first satellite developed and built by Emirati engineers in the UAE at the Mohammed Bin Rashid Space Centre (MBRSC) – from Dubai to Seoul. Specialists from both Emirates SkyCargo and MBRSC worked together for months planning the careful transport and delivery of the satellite which was successfully launched into orbit around the earth in November 2018. Emirates SkyCargo’s fleet of freighter aircraft operated a total of 395 charter flights between January and December 2018. In September 2018, a total of 19 flights were chartered to transport around 500 horses from Liege, Belgium to Greenville-Spartanburg, USA for the FEI World Equestrian Games™ Tryon 2018. Over the course of the year close to 1,800 horses travelled in comfort on Emirates SkyCargo’s Boeing 777 freighters to participate in major international equestrian and racing events. Charter flights were also used to transport equipment and instruments for music concerts and other entertainment events across the world. Emirates SkyCargo connects cargo customers across more than 155 destinations on six continents including over 40 cities linked by scheduled freighter services. The air cargo carrier makes an important contribution to local economies by facilitating exports. 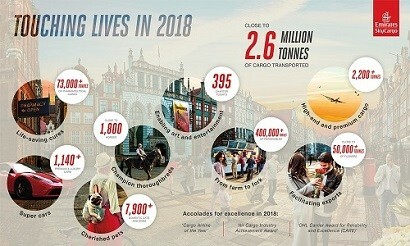 In Kenya for example, Emirates SkyCargo operates a daily freighter service from Nairobi, transporting freshly harvested roses and other flowers directly to Amsterdam, the world’s largest flower distribution centre. The export of flowers directly supports the livelihoods of hundreds of thousands of Kenyans. In 2018, Emirates SkyCargo transported close to 50,000 tonnes of flowers from flower growing nations including Kenya and Ecuador. In 2018, Emirates SkyCargo expanded its reach to include four new destinations. The carrier started freighter services to Maastricht and extended its belly hold capacity to Santiago, Stansted and Edinburgh helping customers in these locations connect with partners in different parts of the world and increasing trade opportunities. In addition to its direct destinations, Emirates SkyCargo is able to connect businesses in other regional destinations through its extensive global trucking network. Between January and December 2018, close to 158,000 tonnes of cargo were transported by truck to or from a destination served by Emirates SkyCargo. At Emirates SkyCargo’s hub in Dubai, the 24*7 bonded trucking service connecting the carrier’s cargo terminals in Dubai International Airport and Dubai World Central moved over 300,000 tonnes of cargo in 2018. From its start in 2014, the service has transported more than 1 million Unit Loading Devices (ULDs) between the two airports. Emirates SkyCargo continued to win accolades for its excellence in air cargo transport service delivery including ‘Cargo Airline of the Year’ at the 2018 Global Freight Awards organised by Lloyd’s Loading List as well as the ‘Air Cargo Industry Achievement Award’ at the World Air Cargo Awards 2018 hosted by Air Cargo Week. Emirates SkyCargo also won a number of awards in regional forums in markets such as India, Italy and Portugal. Emirates SkyCargo was also recognised for the exceptional standard of its processes and service delivery for pharma transport by multiple awards including the prestigious 2018 Carrier Award for Reliability and Excellence (CARE) by DHL Global Forwarding for the second consecutive year.